Different spaces and environments are equipped with specific features that psychologically change ones mood and behavioral characteristics. This is evident in the way we feel and function in our day to day lives in the many different atmospheres we are in. Have you ever noticed the way you feel when you enter into a library or a large room of bodies studying? Doesn’t it psychologically make you feel as if you want to just pick up a book or begin being productive and start doing homework or study notes? This feeling is caused by the built environment of the particular space you are in and the vibes that are emitted from this area. This same concept is also true in different geographical and urbanized or suburban areas as well. For example, the built environment of Atlanta has a special and unique atmosphere that psychologically brings out different emotions and types of work ethics for individuals verses being outside of the metropolitan city area of Atlanta. There are various factors that contribute to a particular spaces built environment. A few of these contributing factors include the architectural structure of a space, the colors associated and themed in a particular environment; and the overall vibes a space emits due to the types of people around, location, and geographical setting. An experiment conducted by psychologists at the University of British Columbia took a look at how the color of interior walls influence the imagination. The results seemed to be noticeably understandable because of how these colors usually make us feel as well. Red was automatically associated with danger, which made individuals of the space feel more alert and aware. The color blue psychologically improved the imaginative power and creative outputs of our brain. Colors are an essential ingredient to the built environment of a space and contribute well to the behavioral and mental states of many individuals residing in the city of Atlanta. We spend our lives inside buildings, our thoughts shaped by their walls (Lehrer). This statement is particularly true for residents in cities such as Atlanta. If we take the time to reflect upon the colors and architectural bodies that people living in Atlanta are faced with on a day to day basis, the truth is that the environment is a very dull and serious atmosphere. Streets are often gray with tall office buildings and skyscrapers everywhere, with little to no natural life or objects of vibrant colors. This built environment that the city of Atlanta has grown accustom to, is psychologically damaging to its residents and workers. People living in cities have a 21% increased risk of anxiety disorders and a 39% increased risk of mood disorders (Jha). As the environment of Atlanta is very fast paced and business oriented, this atmosphere is then transferred into the way people feel psychologically. In some aspects this environment positively effects individuals. For example, because Atlanta is home to two major college campuses in Georgia (Georgia Tech and Georgia State University) as well as being home to many business headquarters, the feelings of productivity and strong work ethic is evident throughout the atmosphere of Atlanta streets. Living in an environment of city buildings and people wearing suits and carrying brief cases adds to the productive aesthetics of the built environment of Atlanta. This psychologically motivates and drives individuals to work hard and be productive just by the vibes emitted from Atlanta’s built environment. City environments that are generally closed off to natural habitats such as parks and gardens have shown to negatively affect ones psychological state. In the article of “City living effects your brain” scientists found that the two regions of your brain involved in the regulation of emotion and anxiety become overactive in city-dwellers. As the reality of homelessness and poverty are evidently displayed along the streets of Atlanta, the atmosphere of scarcity and depression are felt by most individuals and contribute to the built environment of Atlanta as well. There is an increase of anxiety and mood disorder cases within cities compared to rural and suburban life. Personally this has been true to my life as well as many other college students who have migrated to the city for better business opportunities and educational facilities. I am clinically diagnosed with a mild case of general anxiety disorder and having recently residing in the city area of Atlanta, the feelings of this disorder has considerably increased. The city’s built environment that portrays poverty, hopelessness, and basic architectural designs that have minimal color and vibrancy along with being located along side Grady Memorial Hospital and areas of high crime rates heavily increase emotions of anxiety and depression. As the built environment of cities is often too overwhelming for most people, there are many outlets of natural green areas to help alieve the neurological stress associated with city life. Green spaces must be a key consideration in urban planning if the health of a city and its people are both considered important. There are numerous health benefits associated with access to public open space and parks. Access to vegetated areas such as parks, open spaces, and playgrounds has been associated with better perceived general health, reduced stress levels, reduced depression and more. If we take a look at the many public green areas the city of Atlanta has available to its residents and nonresidents, it is evident that though these areas are not heavily advertised, Atlanta has many resources for people to experience wild life as well. The famously known Belt Line and Piedmont Park located in Midtown Atlanta offers a space to get open clean air and experience green natural life. Many people however are not aware of the various small unpublicized areas that Atlanta offers in neighborhood areas located within the city. 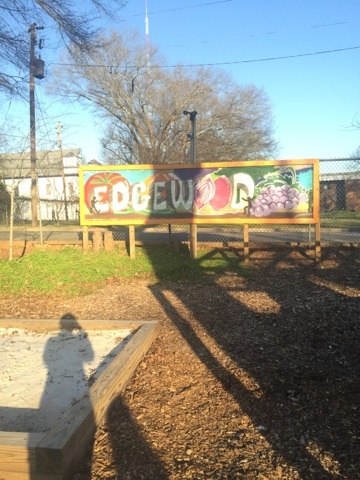 The Edgewood Community Learning Garden for example is a perfect place to relieve some of the stress and seriousness the built environment of Atlanta makes you feel. This garden is the perfect place to get away from the hustle and bustle of the city without having to travel out far. This garden offers a variety of different artifacts spread out sparsely throughout the garden with many different types of greenery and vegetation such as a pollinator garden, a rain garden, fruit trees, berry bushes, and nine veggie beds. The garden is not modern at all but instead has an old-fashioned farm land feel to it because of its wood built architecture and chicken coop located in the back of the garden. The minimal color associated with the garden other than the greenery of the vegetation helps in bringing individuals to a simplistic mindset and focusing more on the literal nature and calmness of the environment. This quaint spacious garden located right outside the heart of Atlanta is open to all visitors and even has an open volunteer page for gardening hours and associated community projects on its website. The garden is about ten minutes outside of Downtown, Atlanta that offers a very free and inviting atmosphere that has a quiet peaceful space to relax and distress. The built environment of green spaces also plays a key role in the mental and psychological state of individuals just as city atmospheres do. Green spaces provide calming and inspiring environments as well as encourage learning, inquisitiveness, and alertness. Green spaces also help in restoring the mind’s ability to focus and study well. Psychologically, the color green is a natural peacemaker that balances out emotions between the head and the heart. Spaces such as the city of Atlanta has very minimal green area which makes the built environment of the space eventually protrude negative and depressed feelings. The built environment of Atlanta due to its loss of greenery, color, and social/ economic conditions force receptors of the brain to psychologically effect the behavior and mood of how we feel. Overcrowding, noise, and social fragmentation all play important roles on developing the built environment of the city. The built environment in which we live in is crucial to our health not solely because of physical health issues, but also our mental health as well. Research shows that improvements to urban life should be made to improve mental and psychological health. The constant feeling of needing to succeed and earn more felt in the city add to the city’s built environment which initially cause stress and fatigue in the mind. Science correspondent Alok Jha states, “What we can do is try and make cities better places to live in from the view of mental health. Up to now, there really isn’t a lot of evidence-base to tell a city planner what would be good, what would be bad.” As improvements are slowly being made to better the built environment of Atlanta, we should also keep in mind that the emotions felt when being in urban settings is simply part of the built environment of the city and that although urban life has its negative effects, the built environment of Atlanta also offers spaces that help alleviate such feeling and emotions as well. Jha, Alok. “City Living Affects Your Brain, Researchers Find.” the Guardian. N.p., 22 June 2011. Web. 30 Apr. 2016. John, Sophia. “Built Environment Descriptions | Sophia John | Page 2.” Exterior Built Environment Description – Edgewood Community Learning Garden. N.p., 13 Feb. 2016. Web. 30 Apr. 2016. Lehrer, Jonah. “The Psychology of Architecture | WIRED.” wev. wired. N.p., 14 Apr. 2011. Web. 30 Apr. 2016. Parallelus. “Urban Planning and the Importance of Green Space in Cities to Human and Environmental Health.” N.p., n.d. Web. 30 Apr. 2016. “The Color Green.” Empowered By Color. N.p., n.d. Web. 30 Apr. 2016.